What people put on the walls in their homes is their own affair; but when it comes to public arts projects political hell often breaks out, whether its NEA support of artists like Robert Maplethorpe, or the differences of opinion over the re-use of the World Trade Center site and the type architecture/memorial/monument that is appropriate and/or aesthetically satisfactory. If you happen to think that Senator Jesse Helms started the controversy over public support of the arts, think again. In fact, start thinking way back in history. How about around 448 BC, which is slightly before Helms was first elected to the Senate. 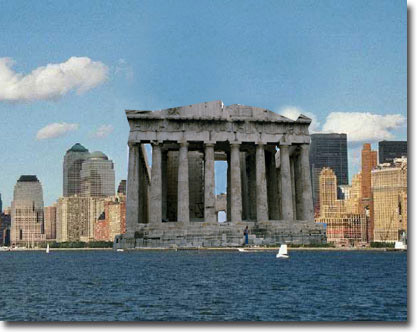 Maybe controversial public art goes back even earlier; but the biggest one of antiquity was over the most famous buildings in the world. The Parthenon in Athens was probably the ultimate public art project. The city’s ruler, Pericles, commissioned the architects Ictinus and Callicrates to design the famed Doric temple to the city’s patron goddess Pallas Athena. The Athenians had just won a war with the Persians, and Pericles (who was also a General) wanted to thank the goddess for her help in that effort. So, not only did he build the largest Doric temple ever, he also commissioned the sculptor Phidias to make an enormous statue of Athena, sheathed in ivory and plates of gold, to put in it. An expensive public art project? You bet. In fact, Pericles didn’t have the money for it. He embezzled the money from a military defense fund entrusted to Athens by several other Greek citystates. He stole it from the Pentagon; sort of an unauthorized “peace dividend” from the DOD to the NEA. In the role of Senator Helms was the statesman Thucyidides, who fulminated that Pericles had adorned the city “like a harlot” (A rather curious choice of phrase, given that the Parthenon translates as “the virgin’s apartment”). It wasn’t a lonely opinion; the Athenians threw Pericles out of office, and Phidias out of town for good for pocketing some of that gold. Partly because of the extravagance the Athenians lost the next war with the Persians, who took the statue of Athena as spoils. But the Parthenon is still there, somewhat derelict, but in tourist dollars it has since earned back it’s construction cost countless times over. Athens wouldn’t be Athens without it. Nor can we imagine Paris without the Eiffel Tower, Rome without the Trevi Fountain, or Washington without the Lincoln Memorial. Much of the reason we like to visit other cities is related to the manner in which they display their aesthetic temperament by way of their architecture, urban design, sculpture, public gardens, festivals and other performing arts. These are the ways they display their personalities, identities, and sense of place. Their public art comprises the artifactual legacy of their civic biography. There is even modest comfort for the bean-counters whose yardstick for public artistic patrimony is the cost-revenue ledger. Like Athens, Venice, Brugge, Leningrad, and many other cities have found their public art to be, if not only a sound civic investment, the inheritance upon which their very economic survival depends. Today, of course, there is a paucity of civic patrons and potentates who are willing or able to regard their cities as galleries for their artistic impulses. Nor, in democratic societies, would we be willing to submit our public art to the aesthetic parameters and power of a Pericles, Medici or Peter the Great. Rather, on a day-to-day, brick-by-brick, basis it is the city planners (along with public arts commissions and other such auspices) who must assemble that patronage, and fashion artistic sensibility from the disparate tastes and dissenting voices of the public, not to mention a pauperized civic purse. City planning today may have more to do with the “art of politics” than the art of urban adornment. So, planners themselves, long inured to the “city functional” and “city efficient,” will need to find persuasive rationale for Philistines like Thucyidides and Helms, that a city, if it is to be “a work of art,” must first be a place for public art.